MANILA, Philippines – The official results of January 2019 Architecture board exam, which include the list of topnotchers or top 10 passers are available online on Wednesday, January 30 or in three (3) working days after the exam. Justin Lei Germino Ramos of Cebu Institute of Technology (CIT) - University aced the board with 83.80%. Carlo Martin Lovete Llanto of University of the Philippines (UP) - Diliman and Christina Marie Reamico Relucio of Technological University of the Philippines (TUP) - Manila, ranked second with identical grade of 83.50%. 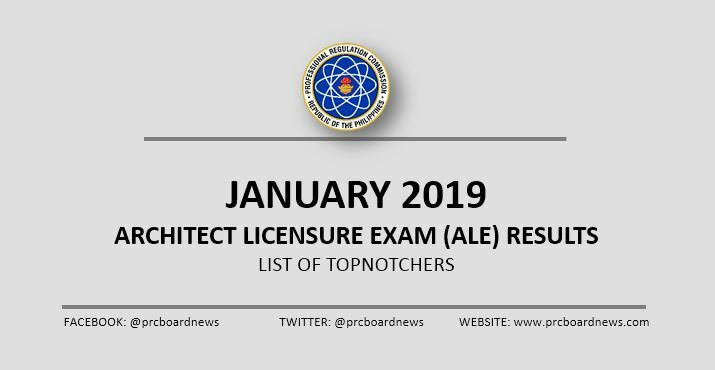 The recent Architect Licensure Exam (ALE) was conducted by the Professional Regulation Commission (PRC) and the Board of Architecture (BoA) in Manila, Baguio, Cebu, Davao, Legaspi and Zamboanga on January 25 (Friday) and 27 (Sunday). The BoA is composed of Arch. Robert S. Sac, Chairman with member, Arch. Robert M. Mirafuente. In the January 2018 ALE, Marc Henrich Wee Eng Go of University of Santo Tomas (UST) led the board with 85.40%. It was followed by Marc Terence Limsico Co and Rafael Cruz Paragas, both from the University of the Philippines (UP) - Diliman, with identical rating of 84.20%. In the January 2017 exams, Luiz Marko Pantua Silang of UPD got the highest place with 83.70%. Robin Royce Yu Ibanez, also from UPD, was on second spot with 83.20%. The exam results look quite impressive because everyone got very high scores and proved his professionalism.